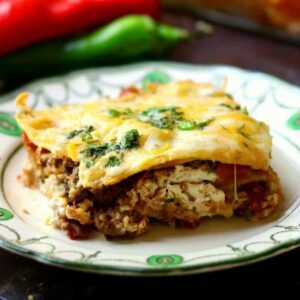 Mexican lasagna recipe made with tortillas is gooey and cheesy – the perfect mixture of Italian and Tex-Mex. Corn tortillas are layered with cheese, refried beans, and spiced ground beef to create an easy meal the whole family will love. Best of all, you can make it ahead of time and either refrigerate it or freeze it for later. Ready to give it a try? 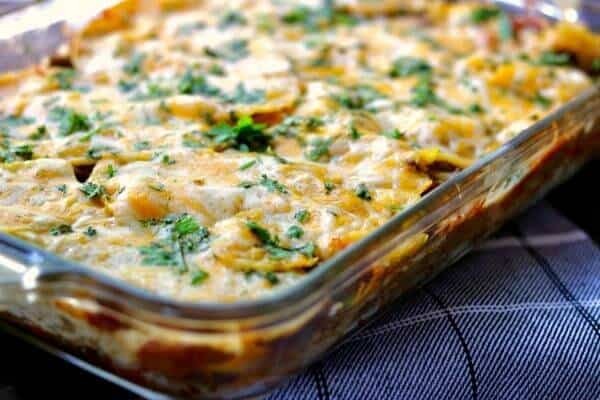 There is nothing in the world more valuable than a great casserole recipe that you can make ahead and either keep in the refrigerator or freeze, am I right? 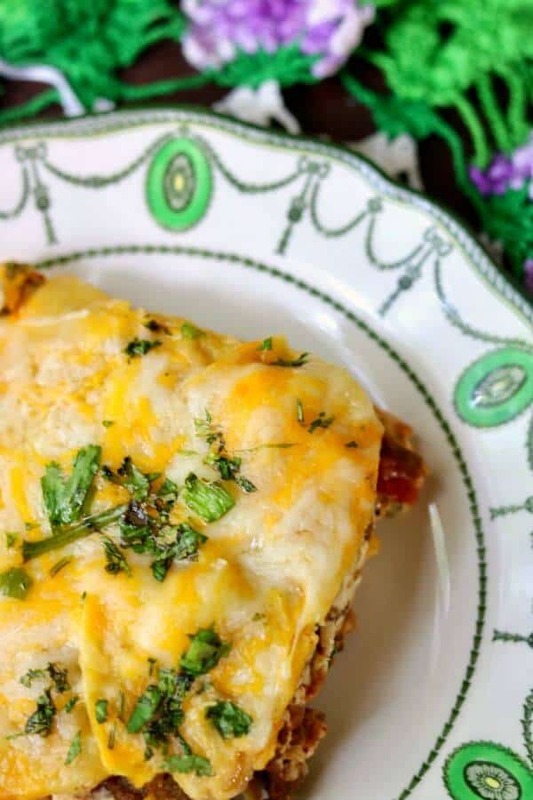 This quick Tex-Mex casserole recipe has layers of South of the Border flavor in every bite. It’s so easy because there’s no noodles to boil. Just cook the beef and start layering the casserole! 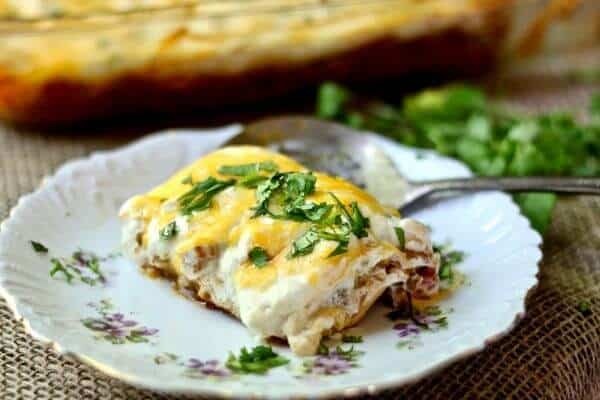 The corn tortillas soften up and soak up the flavors while the cheese adds a rich, gooey texture to this Mexican lasagna recipe. It’s travel friendly and perfect for potlucks! The worst thing about working at home as a food writer is that everyone assumes that A) I have plenty of free time since I am at home all day, and B) I cook intricate seven course meals every night. The truth is that my kids get take-out pizza on a weekly basis and some nights I stare into the dark recesses of the refrigerator willing some delicious concoction to rise from the mists like the sword Excaliber rising from the lake. In other words, I need recipes that I can toss on the table in minutes just like you. My commute may be down a staircase (which can honestly get pretty crowded with the 4 dogs) and yours may be crawling along a clogged highway but we are alike in that getting dinner on the table might be the most frustrating moments of our evening. 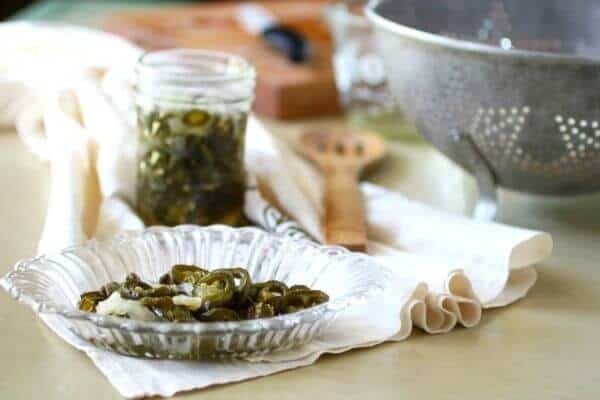 This recipe is one of those that easily accommodates different ingredients depending on what you have on hand. 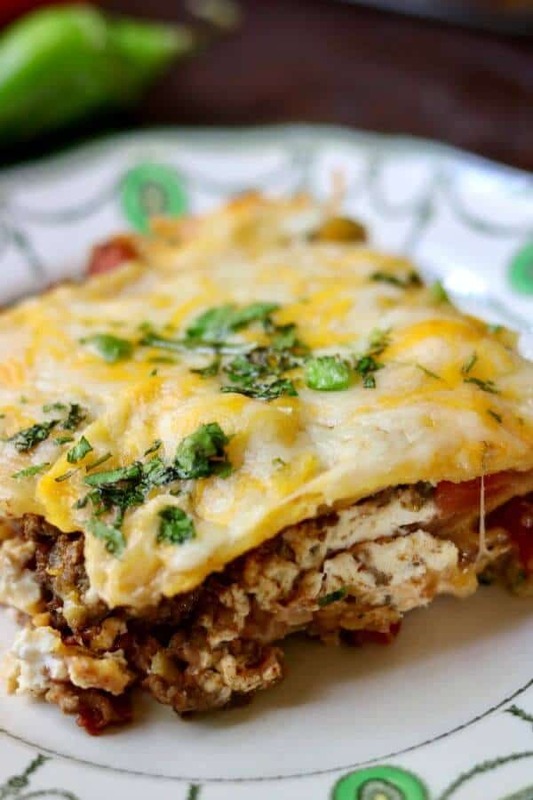 Here are some variations you can easily make in this Mexican lasagna recipe. Follow this plan for a quick and easy weeknight dinner. You can even make this weekly by using the suggestions for variations and no one will know the difference! You can make this extra quick and easy by cooking the beef ahead of time and then assembling the casserole the day before you plan on making it. Just pop it in the oven for 30 minutes while you’re finishing up the rest of the meal and you’re good to go! I like bakeware that is pretty enough to use as a serving piece. This casserole dish is a gorgeous blue. Give the original a try before you make the variations. One thing I like to do is to double or triple the ingredients so I have a casserole or two in the freezer for emergencies- just let it thaw in the refrigerator overnight and bake as directed OR bake it for 1-1/2 hours straight from frozen! Not quite what you’re looking for? 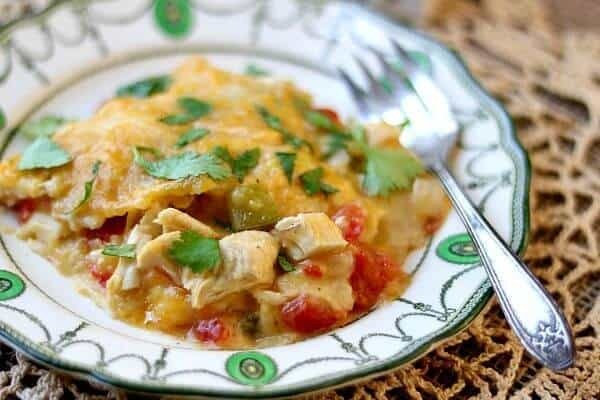 Check out this easy Chicken Enchilada Soup! 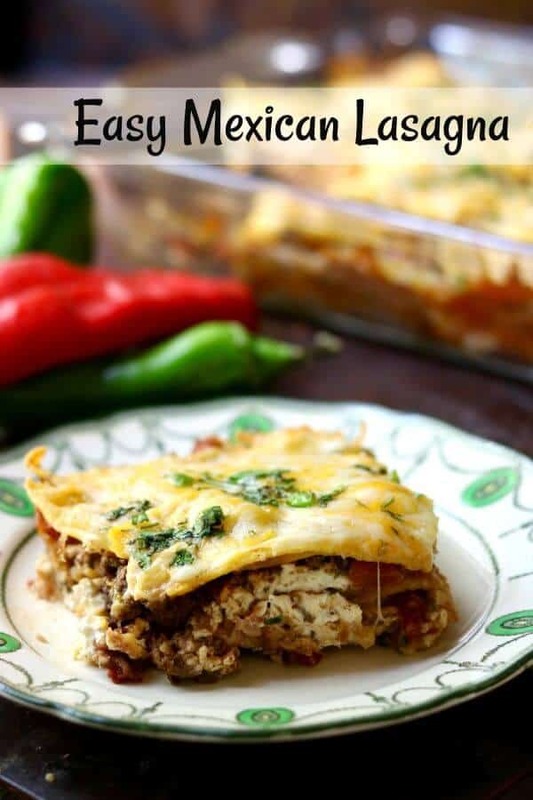 This easy Mexican Lasagna Recipe is perfect for busy weeknights! Layers of taco seasoned beef, cheese, refried beans, and tortillas bake up into a gooey, cheesy, family pleasing meal in 30 minutes! Freezes well, too! Spray a 13x9-inch pan with non-stick spray. Cook the ground beef, stirring to crumble. Add the taco seasoning, tomatoes and chiles plus their liquid, and 1/4 cup of water. Simmer until the liquid has almost evaporated. Stir in cumin and set aside. Whip the cream cheese and 1 cup of the salsa together until smooth. Set aside. Mix the two shredded cheeses together. Set aside. pour 1/2 cup of salsa in the bottom of the pan. Cut 8 tortillas in half. Arrange 2 halves with the straight side toward the long side of the pan. Repeat on the other side. Arrange 1 half with the straight side toward the short side of the pan. Repeat at the other end with the other half. Place two whole corn tortillas down the center. Sprinkle with 1/4 cups chopped cilantro. Spread with half the refried beans, half the ground beef, half the cream cheese, and 1/3 of the shredded cheese. Top with corn tortillas as before. Repeat layers of toppings as before., ending with corn tortillas. Like this recipe? Please consider giving it a star rating! ? Follow me on Facebook and Pinterest! Included in Meal Plan Monday#84 Link up… Check out all the cool recipes! Made this tonight for supper..wonderful! Hi Marye…i really appreciate seeing this recipe. My unique problem is that i am disabled and by the end of the day my energy is gone! I have always been a cook wanting to try new things with lots of ingredients and use it as a way to love on people. But now my life is changed and i LOVE THINGS I CAN PREPARE AHEAD then have at the ready for the oven for my family. Thanks for this one..gonna make it soon!